Eat Drink And Be Me: Who needs frosting? I actually had a dream about cupcakes. Maybe that's not weird. I think it was because I had just tried Dryers Slow Churned Take the Cake ice-cream which is scarily addictive. It's yellow cake flavored ice-cream mixed with frosting and sprinkles. It really tastes like birthday cake. I love it. But, this post is not about ice-cream. After eating that ice-cream, I had a dream about cupcakes. They were yellow cupcakes topped with peanut butter. In my waking state, I would naturally think of chocolate cake or brownies with peanut butter, but I don't think yellow cake would ever occur to me. Tonight I finally made cupcakes with a Butter Recipe Golden cake mix I had on hand. That's not exactly yellow cake, but it's close. My husband and I didn't wait for them to cool before trying out the peanut butter idea...and for good measure...Nutella. 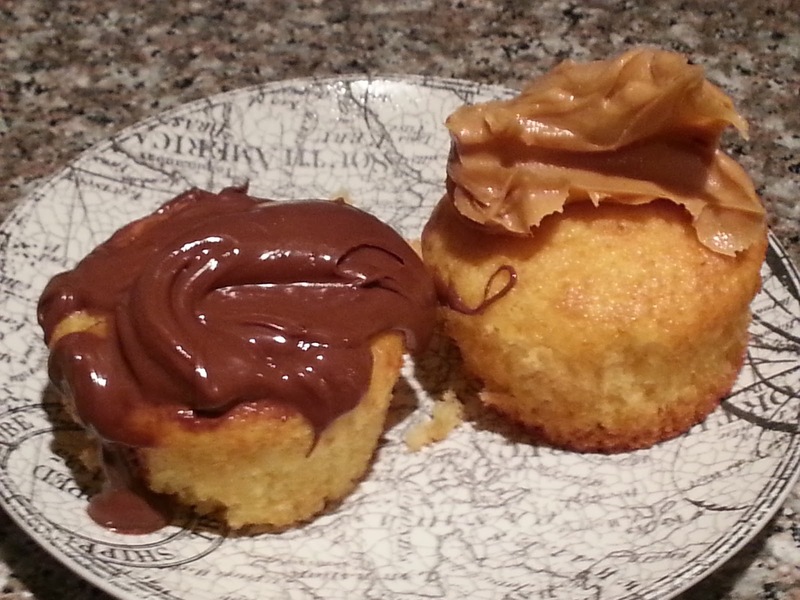 In the picture below, the cupake on the left is topped with Nutella, and the cupcake on the right is topped with peanut butter. I know the frosting job in this picture is messy, but the flavor is amazing. You could get decorative with the "frosting" if you were having a party or bringing them to a potluck, but otherwise, I go for finger-licking good. Who needs frosting? First of all, I could easily argue that both Nutella and peanut butter are way healthier for you than frosting. The sugar content is lower, and if you use natural peanut butter or, even better, almond butter, the sugar content is 0%. 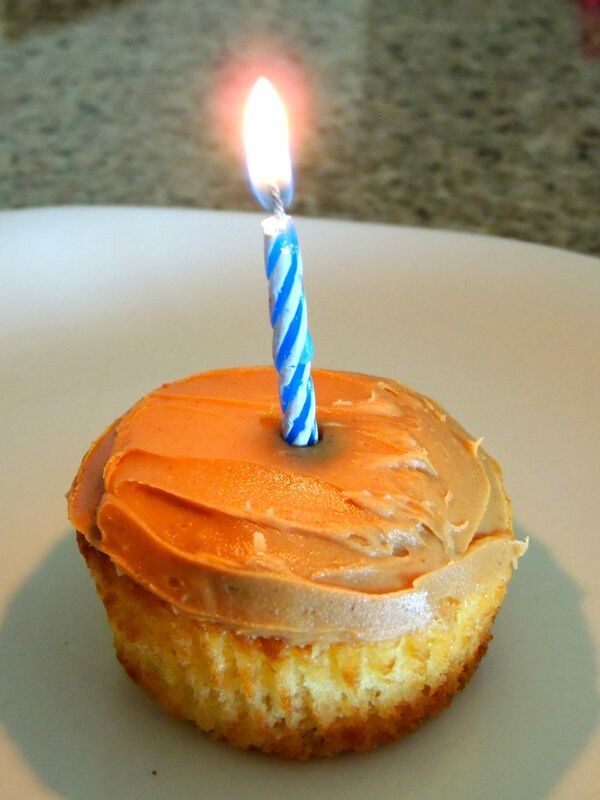 I wouldn't say that a cupcake topped with peanut butter is exactly "healthy," but it's way healthier than the alternative of 2-inch high frosting you get at all these new-fangled cupcake shops. Get creative! When making the cupcakes, you could put half the batter in the cupcake pans, add a dollop of jelly in the center and then put the other half of the batter on top of the cupcakes. Then frost them with peanut butter. It'd be peanut butter and jelly surprise cupcakes. You could also top a cupcake with peanut butter and jelly or make strawberry cupcakes and top them with peanut butter. That'd be kinda like peanut butter and jelly. Any flavor of cupcake would be good with peanut butter, but I did dream about yellow cake, so I'm going to have to say that a yellow cupcake frosted with peanut butter is a Peanut Butter Dream cupcake. Just sayin'. By the way, cupcakes freeze super well. Allow cupcakes to cool completely, and then put the un-frosted cupcakes in freezer bags. When you get a cupcake craving, they'll be there for you. Just stick a frozen cupcake in the microwave for 30 seconds or less, top it with your favorite creative frosting (peanut butter, Nutella, whipped cream, jelly, Greek yogurt, etc, etc...), and enjoy your single serving size dessert. This will save you from feeling like you have to eat an entire cake right away and will help with portion control. I'm making myself hungry. I'm going to have to go get another cupcake...with peanut butter! Then the rest are going straight to the freezer...really. Quick update: My husband and I went out of town for my birthday. I like the tradition of blowing out a candle on a piece of cake, so I took a couple yellow cupcakes out of the freezer and brought them with us. Frosted with peanut butter and topped with a candle, these cupcakes are an easy and delicious birthday treat! I ate mine for breakfast. It was my birthday after all.